The image above looks like an uninspired digital reworking of a beautiful painting, but it's something more. The technique, called wavelet decomposition, shows us the different brushstrokes that make up a painting, and let us see a painter's style in a new way (or an imposter's). Analysis of style is very complicated, which is why so many art critics occasionally fail to spot a forgery. When looking at a painting, they have to take in an entirely new image and consider the subject, the painter's evolving (or devolving) style and skill, and how the passing years might have affected the artwork. Looking at the painting as a whole can be useful, but now we have the ability to break it down. A group of mathematicians took a look at famous paintings, as well as their imitators, and decided to focus on the details. They came up with a program that analyzes brushstrokes — particularly their orientation and grouping. The program takes the angle and orientation of the brushstrokes of a scanned drawing and plots them as a coordinate on a 3D graph. If a subsequent painting has wildly different brushstrokes, it's also plotted on the graph, but will show up far away from the original coordinate. If it has the same brushstrokes, it will be plotted near the coordinate. By looking at which paintings are plotted together, and which are plotted far away from each other, we can guess which are painted by the same person. The team tried their program out on a series of Bruegel landscapes and imitations of those landscapes. 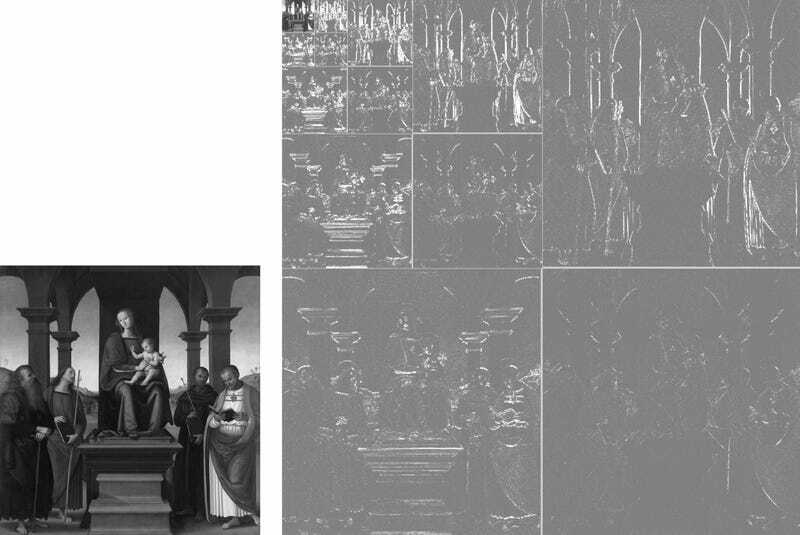 The analysis, called wavelet transformation or wavelet decomposition, spotted all the fakes (shown as squares) and all the authentic paintings (shown as dots). As for the digitally deconstructed painting above, we know that it's authentic. We also know that more than one person had a hand in it. Pietro Perugino was a Renaissance painter so accomplished that he had an extensive workshop. He was the master, painting the important parts of every commissioned painting, and overseeing the project, but he had a number of apprentices training under him. (His most distinguished pupil was Raphael.) As the students gained skill, they were allowed to do more and more important work. Although we know some of the pieces that Perugino painted, we never know quite how many "hands" went into each piece. The faces are numbered left to right, so Mary is three and the baby Jesus is four. Dots one, two, and three, are all close together, and probably done by the same — and most important — artist. Dots four, five, and six are far-flung. It's likely, then, that four different people worked on this painting.